Inevitably, during the planning of the Wedding Photography schedule with our couples, there comes a time when we discuss the possibility of a First Look photo session. To have a First Look photo session refers to the couple seeing each other first before the ceremony and having a photo session at that time. The session, which usually last about 15 minutes, captures that very special intimate moment when you see your bride and groom for the very first time fully dressed before the ceremony. Of course for some seeing your future wife or husband before tying the knot may be considered unacceptable or even as bad luck in some cases. This unique custom and superstition comes from the past when arranged marriages were a normal occurrence. The wedding was sadly often a business exchange between families. The parents of the couple feared that this business deal was at risk if the couple saw each other beforehand. The groom perhaps would change his mind if he thought that the bride was not attractive enough, casting shame on both the bride and the bride’s family. To prevent such an occurrence, the couple was forbidden to see each other before the wedding. Superstitions, such as “bad luck to see the bride in her dress before the ceremony”, were created to protect the arrangement between the families. The bride’s veil was introduced with the original purpose of keeping the groom from finding out what his bride looked like until the very last moment when it was simply too late. How romantic is that?! Of course today arranged marriages are not very common. We sincerely respect that some couples choose not see each other before the ceremony in keeping to this more traditional approach. However, we also see great value in a First Look photo session. Below are just some the reasons why we often recommend a First Look session. 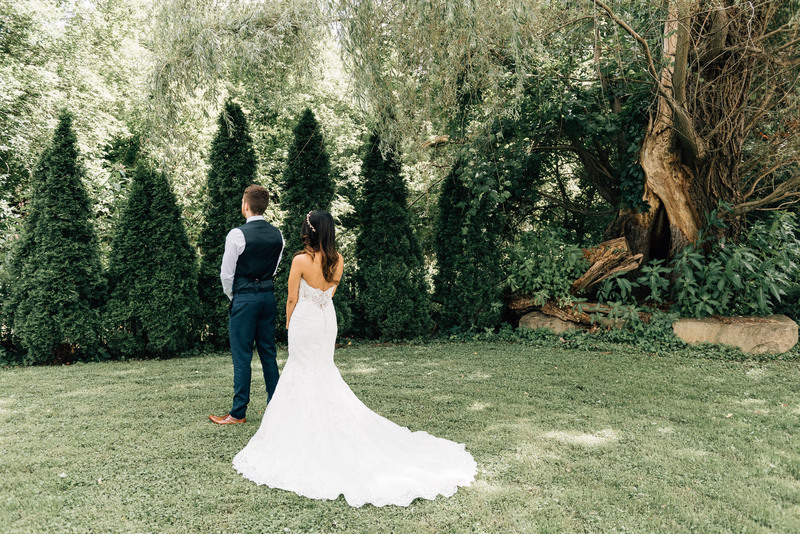 If your ceremony starts late and is quickly followed by the reception dinner, there may be very limited time for a photo session between the ceremony and dinner. We may simply not be able to fit a family session, a bridal party session and your bride and groom session in such a limited time. This is especially true if you have a large family or a large bridal party. In this case a First Look photo session before the ceremony may be the only way to go. After such a session, provided time allows, you may be able to add additional sessions before the ceremony to balance the entire photography schedule within the available time or to gain more photos than you normally would with just one session after the ceremony. Its not unusual for couples to have a bride and groom session, a bridal party session and even a close family session after a first look and before the ceremony. A wedding day flies by so very quickly. Often many of the customs and traditions are there for the benefit of the guests and not so much for the couples. Seeing your fiancé for the first time during the ceremony is a very special moment. It is a moment however which you share with dozens of people and not intimately with your partner. Having a First Look session allows you to have a quick timeout. To see the love of your life and remember what brought you together to this special moment. A traditional first look photo session, starts with the groom standing backwards to the bride. The bride slowly creeps up to the groom. After tapping him on the shoulder he turns around. This moment and the expressions on their faces captured forever by the camera. However, First Look sessions allow for creativity beyond the above and are much more flexible in capturing the initial expression on your face than when you see your partner at a ceremony. A good example of such a creative approach to a First Look is when we blindfolded Timur and let his groomsman lead him to, his soon to be wife, Sam and the waiting bridesmaids. 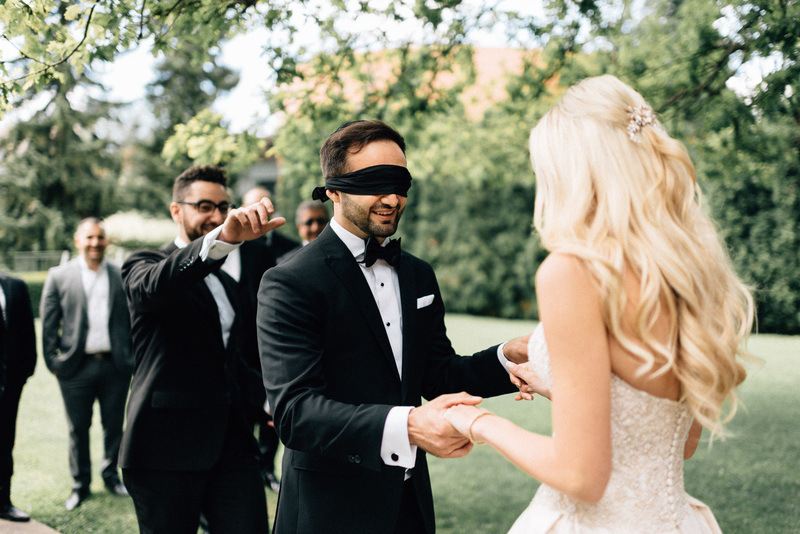 After a suspenseful moment the blindfold came down and the couple saw each other for the first time. They reacted not only to the stunning presentation of their loved ones before them but to the joy that such a session brought them. How lucky are we to capture this great moment! This is just one example of the fun you can have with a First Look photo session. 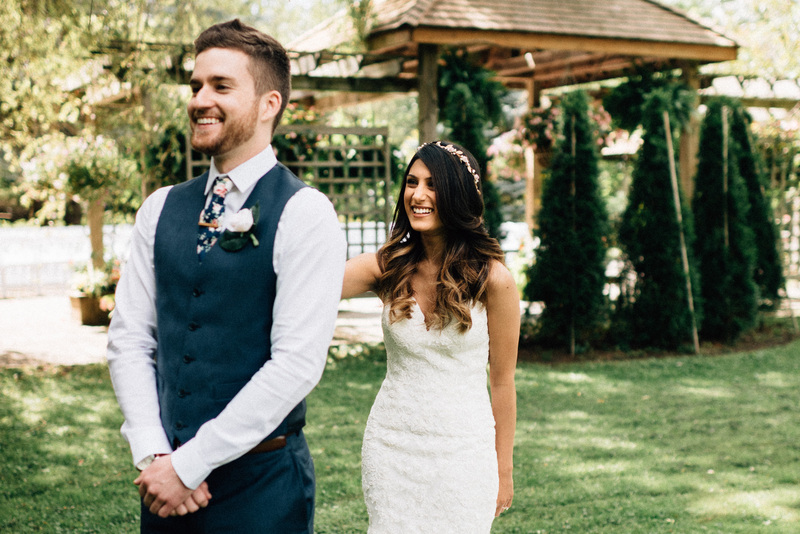 As we mentioned before, seeing your future wife or husband for the very first time at the ceremony is a shared moment with all of your guests. Although this communal instant is beautiful by design it also can be a little overwhelming. How should I look? Are people looking at me? Should I react with more awe as my stunning wife approaches, or less now? Sometimes its easy to overthink things. A private First Look however is usually much easier on the nerves without the pressure of the spotlight created by all of the guests and the ceremony itself. This authenticity is visible in our First Look photos which capture this candid moment in a much more intimate setting which you can control. The good news is that this awesome feeling of seeing your true love, does not go away after the First Look! You will feel it again at the ceremony. So many times we had great reactions at both the First Look session and than again at the ceremony. Some of you may have decided long ago if you would or would not like to have a First Look photo session. For those of you who prefer to see each other for the first time at the ceremony, we understand and respect your decision. If you however are on the fence, please take a moment to consider the above points. You just may find that a First Look photo session is right for you. Of course, if you have any questions about such a session or anything else, please let us know. We are always happy to help. Also, follow us on Instagram for more images!